Worn canvas bags have become this summer’s must-have accessory for locavore shoppers. They boldly declare their superiority to the plastic bag, now widely considered passé and a detriment to the environment. These fashionable totes are probably carried to the local farmers’ market at least once a week. There, shoppers mingle with farmers in the late-summer sunshine, and everyone basks in the warmth of community connections as they select from a bevy of locally grown bounty. Good shopping made simple, right? Not necessarily. Supporting your farmers’ market is one way to participate in the national conversation about food, but it still requires some shopping savvy to know what is truly in season. Always-available rows of perfect produce at the grocery store have dulled shoppers into believing that if it’s pretty and says “organic,” it’s going to burst with flavor. The same goes for that lovely fruit on display at the farmers’ market. When it comes to fruit (who doesn’t know the disappointment of biting into a bad peach? ), Ms. Madison advises picking it up and inhaling deeply. If the aroma entices as much as the color, you’ve got a winner. Forget squeezing, which will reveal nothing and cause bruises. If farmers offer a sample of their crop, try it. Better yet, get to know your regional growing cycles and stand firm against visually alluring produce outside its peak. This is especially true for fruit, which doesn’t ship well. 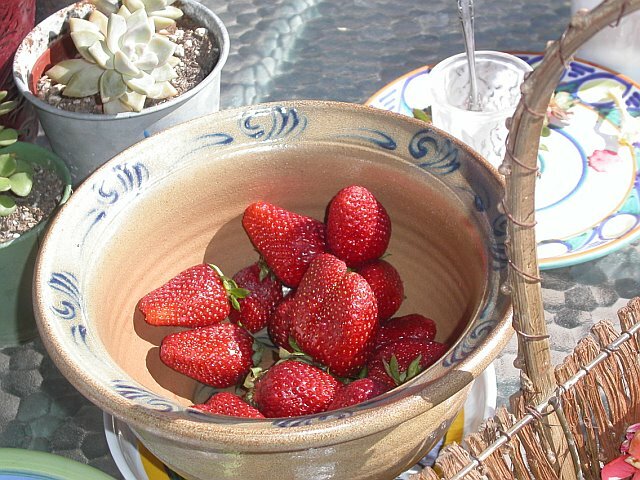 “I never eat strawberries unless I travel to California,” says Madison. In New Mexico, where she lives, August belongs to chiles. “The smell of roasting chiles in the farmers’ market is one of the delights of this time of year,” she says. Try Madison’s simple hunger fix made with chiles and warm goat cheese wrapped in a tortilla. And let those memories of hard, tasteless fruit melt away. Warm roasted chiles slipped into a fresh tortilla with a piece of local goat cheese is one of the best ways to satisfy that after-shopping hunger. Roast the chiles until charred, then drop into a covered bowl to steam for 10 to 15 minutes. Slip off the skins and pull out the seeds, then pull into strips with your fingers. Place the tortilla in a dry skillet over medium heat. As soon as the bottom is warm, flip it over. Put the chiles on top, crumble the cheese over it, and add the cilantro. (You can add salsa, too, if you like.) When the cheese starts to soften, slide the tortilla onto the counter, then fold it in half. Press down, wrap in a napkin, and enjoy. Serves 1. This article first appeared in The Christian Science Monitor. To hear my interview with Deborah Madison, click here.